Zhanshi Slots is an Asian / Chinese themed progressive jackpot slot machine that features five reels and twenty-five pay lines. Real Time Gaming software powers Zhanshi, which was released in March 2016 after Eternal Love was published in February 2016. Play Zhanshi online slots real money and have to opportunity to win the progressive jackpot. Win the bonus games, plus multiply your winnings and get free spins. This all-new Real Time Gaming slot machine features scatter and wild symbols. After doing a plethora of ‘research on Wikipedia’ about the meaning of the name Zhanshi In the Chinese language we have found that has several different means. The Zhanshi progressive jackpot slots is available to play for real money on the Internet with no download. Enjoy the game using your tablets and mobile Smartphones at any of the best USA online casinos that we have listed on the right-hand side of this review page. Make sure that you click through one of the Play Slots 4 Real Money links and banners, so you ensure yourself that you claim you’re free spins online slots bonuses. The ‘Zhanshi’ RealTime Gaming slot machine is a typical RTG game but it does have some unique features like the random progressive jackpot that begins at ten thousand coins. This game is also unique because it is HTML5 compatible, which means that you can play on almost any Android or Apple iOS device. The symbols that you will see when playing Zhanshi USA online slots are Chinese themed houses and artifacts. The sounds are not that best however they do portray the war-like theme, and it gives it a nice touch. Real Time Gaming (RTG) software has been adding a new game every month recently. They have also been improving their graphics and adding cool visual effects plus more ways to win during the regular game as well as the bonus rounds. 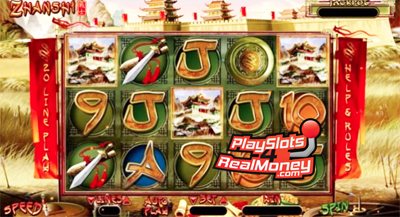 This online slot machine for real money features two bonus rounds that you can trigger when you land the Zhanshi warrior Wild symbol on the reels. You can also trigger the rounds when you three or more of the Temple scatter symbol. Keep your eyes out for the Zhanshi warrior and the Temple icons! When you get to the first bonus round, you will win twenty-five re-spins as well as the opportunity to multiply your real money winnings by three times. The second bonus round does not have as many free spins but has a larger multiplier. Give it a try for free at one of our recommended USA online casinos that accept major credit cards and Bitcoins.